ZIMBABWE and Malawi enjoy frank and cordial relations and Harare looks forward to working well with the new administration led by Prof Arthur Peter Mutharika, President Mugabe has said. Speaking to journalists at the Kamuzu International Airport in Lilongwe yesterday after attending Malawi’s 50th independence celebrations, President Mugabe underscored the need to further strengthen the already warm relations between the two countries. “We are very happy to celebrate together this anniversary. I happen to have been there when Malawi started its independence. I was able to see the development and the change that has taken place. 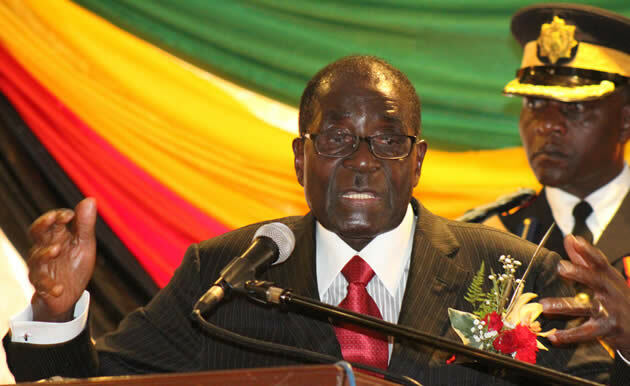 The freedom that has come to the people and the right to do things for themselves,” President Mugabe said. He said Malawi’s first black President Dr Hastings Kamuzu Banda, was keen on addressing the issue of illiteracy in his country and to develop agriculture. “When (Bakili) Muluzi took over, the relationship had been absolutely frank,” President Mugabe said. He narrated how Zimbabwe went on to enjoy warm relations with other administrations that followed and expressed his wish to associate well with the newly elected president, Prof Mutharika. President Mugabe said Zimbabwe and Malawi shared a historical and cultural bond. Earlier on, President Mugabe had received a hero’s welcome at the Civo Stadium, where thousands of Malawians gathered for the Golden Jubilee celebrations. Addressing the gathering, President Mutharika urged unity among Malawians regardless of political affiliation. “I invite all of us together; let us unite to develop this country. We all must love our country. Let us unite as one country. We are all Malawians,” he said. President Mutharika challenged Malawians to work hard and bring development to their country and dissuaded them from depending on government for aid. He pledged to provide low cost housing units for urbanites and to build proper houses in rural areas. Malawi is a former British colony, which gained independence in 1964 after the collapse of the Federation of Rhodesia and Nyasaland that brought together Northen and Southern Rhodesia (now Zambia and Zimbabwe) into a federation with the then Nyasaland (now Malawi) between 1953 and 1963. Malawi celebrates its independence on July 6 every year. President Mugabe returned home yesterday evening and was welcomed at Harare International Airport by Vice-President Joice Mujuru and senior government officials.